Nations like Haiti don’t “fail” because of their people, but because they’ve been relentlessly exploited by the more “developed” world. How does a state fail? It’s a question you can’t help asking yourself as you make your way in Haiti, through the chaos left by four severe tropical storms in 2008 and the destruction wrought by the 2010 earthquake—some of which is still evident on the streets of Port-au-Prince today, five years later. It’s not just the unrebuilt infrastructure that raises this question, but also the human and political waste caused by so many years of corrupting collaboration with the United States, the United Nations and outside nongovernmental organizations (NGOs). A state doesn’t fail because of some innate inferiority in its people. I make this obvious point only because people who don’t know Haiti often try, as subtly as they know how, to claim this is the case. They’re wrong: a state fails because of its history. Haiti from its inception has been a peculiarly globalized entity. The slavery with which the French colony enriched itself was a global labor and agricultural phenomenon, bringing people from Africa to the Americas in order to serve as free labor on plantations owned by Europeans. 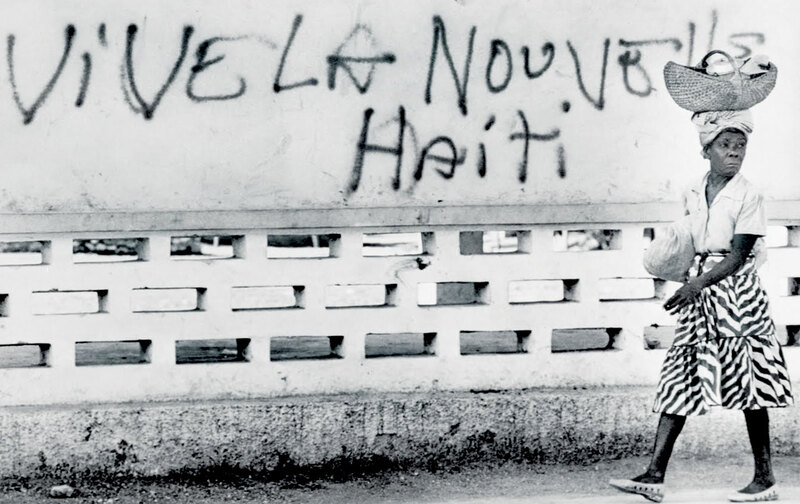 Haiti’s revolution, too, was a global phenomenon, linking those same three continents. Haiti’s early debt was global; its economics under slavery and, later, the US occupation were global as well—and still are. Many readers of The Nation may know something of the remarkable history of this country, since the magazine has been following it for more than a century. But for those of you coming to it cold: Haiti had unbelievably promising beginnings. Though tarnished by centuries of slavery, the country was the creation of some of the great geniuses of the 1700s. But the enormous potential of these singular men was destroyed by France, which kidnapped and killed some of Haiti’s ablest leaders, most notably Toussaint Louverture. In 1825, a scant two decades after Haitian independence was declared, France demanded an indemnity of 150 million francs (roughly estimated at $20 billion in today’s dollars) for the property lost by French plantation owners during the quite bloody, quite fiery revolution—one that Haiti had won. Haiti was to compensate France not only for lost plantation lands and crops, but also for the loss of the Haitians themselves—i.e., for the right to be masters of their own bodies—since Haitian slaves had been France’s most valuable Caribbean asset. France backed up this demand with the threat of a full-blown blockade, and Haiti agreed to pay in exchange for France’s recognition. As a result, France duly recognized Haiti as an independent country (the United States, still a slave-owning nation and too geographically close for its own comfort, did not do so until 1862, in the midst of the Civil War). The huge debt payments were delivered assiduously by the Haitian government with money borrowed—conveniently—from French banks. Haiti also paid the interest on those loans in a timely fashion. These reparations to France depleted Haiti’s already starved coffers and led to repeated financial crises within the country. They also led to privations, to an inability to develop domestically and to political instability—indeed, political turmoil, with presidents entering and leaving office sometimes biannually. France, in collusion with the United States, continued to bleed Haiti until related debts were finally paid off—in 1947! This is how Haiti began to be a failed state. Nothing that the occupation built was meant to benefit Haitians. As Ernest H. Gruening wrote in 1922 in this very magazine: “nobody, be he ever so kindly and human, can wholly transmute a military Occupation into a lawn party.” During the nineteen-year occupation, periodic rebellions and uprisings were brutally put down by the marines. Finally, in 1929, another massacre of Haitians provoked a review of the occupation by Congress, as well as an eventual pullout in 1934. Nineteen years of occupation left enduring scars on Haitian society. The racism and segregation enforced by the marines led directly to the reactionary black-power rhetoric employed by François “Papa Doc” Duvalier as he rose to power in Haiti. The brutality and kleptocratic behavior of Duvalier’s administration, while not unknown in pre-occupation Haiti, had been honed to a fine point under the Americans’ regime. The nightmarish Duvalier and his corrupt son and successor, Jean-Claude (“Baby Doc”), fertilized the terrain on which Haiti as a failed state would grow. Haiti has never existed in a vacuum. In fact, Haiti today is a creation of the world, its failures often purposefully molded by outsiders, though almost always in collusion with the Haitian elite, who stand to profit from these failures. In this, it is not dissimilar to other corrupt countries with a history of colonial exploitation. Here is a contemporary example of how this works: under Bill Clinton, Haiti’s leaders were pressured to reduce the country’s longstanding tariffs on imported food (including rice) from 50 percent to about 3 percent. The United States then began dumping cheap, taxpayer-subsidized surplus rice on the Haitian market, ostensibly for humanitarian reasons, but actually so that it could dispose of an otherwise unsellable product. Clinton’s policy was brilliant and double-edged. The Haitian politician who had to approve it was none other than the overthrown Jean-Bertrand Aristide, arguably the first freely elected president of Haiti. Aristide had been ousted in 1991, less than a year after his election, while George H.W. Bush (Papa Bush) looked the other way. Doubtless in return for Aristide’s acceptance of the lower tariff, as well as for other promises made, Clinton returned him to power. But once back in the National Palace, Aristide saw his authority undermined by the havoc and unrest that this very policy was causing in the countryside. The cheaper US rice undercut and effectively destroyed Haitian rice farming. A country that was largely self-sufficient in this staple in the 1980s was importing 80 percent of its rice by 2012. The crisis in rice farming also initiated a huge flow of rural people to the capital, because rice cultivators and their families could no longer survive in the countryside. The resulting overpopulation of the capital was a factor in the large number of people killed in the 2010 earthquake. After the quake, Clinton—by then the UN special envoy to Haiti, helping to run the reconstruction effort—apologized to the Haitian people. “It may have been good for some of my farmers in Arkansas, but it has not worked. It was a mistake,” he told the Senate Foreign Relations Committee in 2010. “I have to live every day with the consequences of the lost capacity to produce a rice crop in Haiti to feed those people because of what I did; nobody else.” He has called the policy a “devil’s bargain.” Nonetheless, imports of subsidized American rice only increased after the earthquake. Haiti imports as much as 50 percent of its food now, mostly from the United States. Today, Haiti is the second-biggest importer of US rice in the world. Now let’s look at politics. In 1991, Aristide was overthrown. In 1994, Bill Clinton reinstated him. Aristide served out his truncated five-year term and was elected president once more in 2000, only to be overthrown again, in 2004, this time under Baby Bush (George W.). For seven years after that second coup, Aristide lived in US-imposed exile in South Africa. He was allowed back into Haiti only in 2011, when President Obama, given various factors, could no longer reasonably prevent his return. Though Aristide was, for at least two decades, the overwhelming choice of the Haitian people, his support has dissipated in the chaos caused by two anti-democratic coups and a barrage of natural disasters, as well as the generational shift that has come with new voters who simply don’t remember him. Even so, the current Haitian president, a conservative Duvalierist who is another puppet of the United States, has recently put Aristide under illegal house arrest, fearing his potential as a disrupter as Haiti begins the long-overdue slog to a new round of elections. That Haitian president is Michel Martelly, a pop singer whose slender victory in 2011 was engineered with the collusion of the United States, the UN and the Organization of American States (OAS). With his pro-business stance, Martelly is a lot more to the liking of American corporate interests in Haiti than Aristide. Among his greatest achievements as president: diverting earthquake-relief money to help extend and modernize transportation in northern Haiti, far from the earthquake’s path, as well as expanding the incentives to seduce low-wage light industry to Haiti (mainly in the north) and freeing up gold-, silver- and copper-mining contracts for giant multinational extraction companies to begin excavating (also in the north). Is the failure of the democratic experiment in Haiti the fault of a people who cannot govern themselves? No, it’s the fault of outside interests and their Haitian collaborators, who together continue to hold the reins of power in Haiti. By the way, I don’t mean to suggest that Aristide was democracy personified. He was flawed, but so what? Let’s put it this way: unlike Aristide, the Duvaliers—both Papa Doc and Baby Doc—were grotesque violators of free speech, honest elections and human rights, but still they managed, in the shadow of the United States, not to be overthrown for almost thirty years. Aristide, in that same shadow (Haiti hasn’t moved! ), was overthrown within eight months of taking office, and then overthrown a second time. This is not about a state’s failure; it’s about failure imposed on a state. Let’s also consider corruption, another symptom of failed states. Many say the Haitian government is disorganized, but no one is fooled: actually, the Haitian kleptocracy has been carefully organized—especially during the occupation—to be porous and incompetent, to allow for corruption. It exists to feed those politicians who kowtow to outside interests. It is a mechanism into which money is poured and then siphoned off. The Duvaliers merely perfected what the occupation handed down. Since 1915, the United States has treated Haitian governments as, at best, rubber stamps for US policy, American businesses working in Haiti, and Haitian-run businesses friendly to American interests. For almost the entire twentieth century, only US-approved Haitians could be president. The embassy looked the other way at internal political repression, to say nothing of continuing starvation in the countryside, as long as Haitian governments were friendly—or at least anticommunist, like Papa Doc’s. Any leader who seemed to have an agenda that put the Haitian people first was thrown out, including Daniel Fignolé, a wildly popular political figure who was in office less than a month in 1957, shortly before the Duvalier dictatorship; and, of course, Aristide, who slipped in during a moment of change in Haiti and the world (post-Duvalier and post–Cold War, respectively) but was quickly sent packing. Ever since Aristide was deposed for the second time, in 2004, there has been another occupation of Haiti, this time by the United Nations. A decade later, some 7,000 international military and police personnel still operate from the huge, modern UN Logistics Base near the airport (which is no longer named for François Duvalier but for Louverture, another coup victim sent summarily overseas). From “Log Base,” as it is called, peacekeepers have been sent out to quell dissent, resulting in many casualties. They’ve rounded up the discontented and they’ve developed informants within progressive and popular movements. They ride around town in casual pickup trucks with gunners in the back, facing the trailing traffic. All of this is done with the ostensible motivation of protecting the Haitian people and keeping things secure. As The Nation’s Gruening wrote concerning the marine occupation in 1922: “this proceeds under the guise of benevolence…. Colonel Russell [the head of the occupation at the time] told me that it was the two million Haitian country people that he wanted to help, and that he was very fond of them but [that he was] against the ‘three hundred agitators in Port au Prince….’ The Occupation’s affection for the Haitian proletariat is truly touching. Obviously if the [agitators are] eliminated, the most docile and the cheapest labor supply that a concessionnaire ever dreamed of will be easily available. Twenty cents a day is the current Haitian wage.” Today, thanks to the machinations of American businesspeople in Haiti and colluding legislators in Washington, the minimum wage has been kept low: to less than $5 a day. Haitians’ 1922 pay comes to roughly $2.82 in today’s dollars. So, in ninety-three years, the value of a Haitian’s labor has increased by little more than $2. One final problem must be understood in picking apart the failure of the Haitian state, and that is the overwhelming presence in Haiti—especially in Port-au-Prince and in Cap-Haïtien—of nongovernmental organizations, usually foreign-based. Unscientific estimates suggest there are some 10,000 NGOs operating in a country smaller than Maryland with a population of 10 million. The end of Haiti, its utter ruin, has been predicted since the state was declared in 1804. The outside world believed a country run by former slaves could never survive; Haitians looked around and sometimes agreed. In 1944, the legendary Haitian novelist Jacques Roumain published Gouverneurs de la rosée (Masters of the Dew), set in a deforested, drought-plagued landscape. When I first arrived in Haiti in 1986, the environmental end of the country was already considered imminent. Everyone would starve and die; AIDS, too, was about to take its toll. Today, Haiti is still deforested, the environment abused and ignored. Much of this has to do with dire poverty and government negligence, as well as foreign and domestic exploitation. But in spite of deforestation and drought, despite mudslides and hurricanes and earthquakes, despite the destruction of rice cultivation, the collapse of Haiti’s sugar industry, the neglect of its coffee cultivators, the ongoing crisis of AIDS, tuberculosis and, now, cholera—Haitians survive. Is this because they have a special resilience, that “dignity in poverty” that visitors like to rattle on about? Nope. It’s because the situation has been so bad for so long that almost every tiny Haitian village has sent at least one person out of the country into the huge diaspora, and those wanderers (equal to about 20 percent of the on-island population) have been sending their dutiful remittances back, even over generations. This immense brain drain has adversely affected everything on the island, but it has also been crucial to Haiti’s survival as a failed state. Many small, formerly agricultural countries survive this way in the globalized world. The Philippines is another good example: its government, like Haiti’s, provides few services and little employment for its growing population, and instead sends its people out to participate in a global economy from which, although poorly paid by employers abroad, they can send home enough money to keep people alive on the islands. Sri Lanka, Vietnam and many other countries survive in a similar fashion. Living off such remittances, those who still reside in the home country are less likely to find themselves at that edge of desperation where political organization and unrest become urgent and necessary. Grassroots change is abortive or endlessly deferred, a situation that is much preferred by the small local elite, which provides nothing and thereby gains everything. Haiti’s ongoing crisis is the product of global forces, and only huge, unlikely changes in international behaviors—especially on the part of the biggest, most abusive nations and organizations—will allow the Haitians themselves to turn things around.